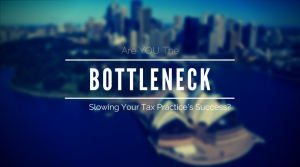 Are YOU the Process Bottleneck Slowing Your Tax Business Success? A process-driven tax business follows a series of exact steps done in the same order and the same way every time. There’s no randomness. No spontaneity. Everyone in the office follows these steps or there are negative consequences. The processes in this kind of tax practice are easily replicated. 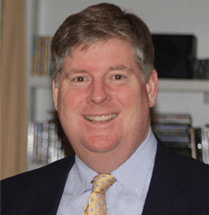 When issues good or bad arise, everyone in the office has to run it through the owner. This creates an unnecessary ceiling that keeps MANY tax practices from growing and making any significant money. Big money breakthroughs cannot take place in this environment. If you, as the owner, are the problem because most of your office runs through you and you don’t have a series of exact steps which are done in the same order in a systematic fashion in your office, THEN THIS IS A RED FLAG. As the owner of your tax business, your main goal is to get someone else to handle each event in your office BETTER than you would ever be able to do. Once your employees are delivering excellent service by following each of the main processes you’ve put into place, the office can run at peak efficiency, even when you’re NOT in the building. Many tax business owners don’t believe this scenario could ever be possible for them. You say you’re sick and tired of doing all the work. But when push comes to shove, too many times the owner is unwilling to take the not-so-hard-next-steps that free them from the chains of their tax business’s operational jail. I can speak from personal experience. It was better for everyone in our tax offices for me to get out of the way and let my staff do their thing. I hired them to use their particular talents and skills. These employees are good; they wouldn’t be there otherwise. And this way there are less headaches and stress for me. Isn’t this what’s supposed to happen when you truly systemize your tax office? So if you are still being a bottleneck for your tax office’s operational flow, it’s time to take a look in the mirror and make the decision once and for all to allow your tax business to grow without you holding on to every little detail so tightly. Once you let go, and invest in other people working for you (following the processes you have set up for them), your tax business will begin to shift to the next level of success. The more you hold on, the longer the next level of success will escape you. Here’s the important wealth attraction insight I want you to get. Your marketing, salesmanship, recruiting, hiring, training, pricing strategies, and most every other important area are NOT performing to the level you know they could BECAUSE YOU ARE MISSING THE PROCESS. If you put the right processes in place in all of these areas, your tax practice will go from an Event-Driven Business to a PROCESS-Driven, Well-Oiled Machine. When everyone in your business follows established, successful processes every time – your tax business will produce more wealth automatically. And not just in one location. Once one tax office’s profit flows like a river, you will seriously consider opening more locations.